Welcome to Chichester Beauty Salon we specialise in Caci Non Surgical Facelift, Electrolysis Permanent Hair Removal and Russian Volume Eyelash Extensions using the latest Lash Perfect technologies. CACI facial at Chichester Beauty, a Non-Surgical Facial Toning lift. With over twenty years medcal research Caci works with micro-current impulses lifting and toning the facial muscles and the neck area, whilst improving skin’s elasticity and reducing the appearance of fine lines and wrinkles. Please call Chichester Beauty to discuss any questions you may have about Caci. Electrolysis hair removal is an alternative to laser hair removal. It removes all colours of hair unlike laser which only removes dark hairs. Electrolysis removes lighter hairs, blonde, grey or white hairs on the face and body. The treatment inserts a probe, the width of a hair, into the hair follicle and delivers an electrical current. The current passes down the probe to heat and destroy the hair’s root, which prevents further hair growth. The Russian Layering Technique (also known as Russian Lashes and 2D-8D lashes) originated in Russia and has recently made a breakthrough in the US and UK. This technique is done by applying multi-lash synthetic, ultra-fine lashes onto a single natural lash. The great benefit of Russian Layering is that it gives a full volume and high impact glamorous look with no damage to the natural lashes. CACI facial at Chichester Beauty, a Non-Surgical Facial Toning lift. With over twenty years medical research Caci works with micro-current impulses lifting and toning the facial muscles and the neck area, whilst improving skin’s elasticity and reducing the appearance of fine lines and wrinkles. Please call Chichester Beauty to discuss any questions you may have about Caci. Electrolysis hair removal is an alternative to laser hair removal. It removes all colours of hair unlike laser which only removes dark hairs. Electrolysis removes lighter hairs, so light, blonde, grey or white hairs on the face and body. The treatment inserts a probe, the width of a hair, into the hair follicle and delivers an electrical current. The current passes down the probe to heat and destroy the hair’s root, which prevents further hair growth. Chichester Beauty is a home based salon situated just behind the cattle market in Chichester, with off road parking for your convenience. 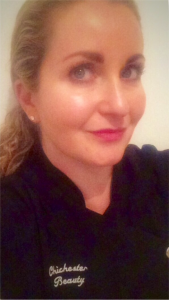 Fully qualified beauty therapist since 1996, Julie Rowlands set up her own beauty business in 2001. Having required the BTEC National Diploma in Beauty Therapy and Lash Perfect Qualification (Multi Lash Advanced). Many years of experience within the beauty profession has proven the catalyst to her career. Chichester Beauty specialises in Caci Non Surgical Facelift, Electrolysis Permanent Hair Removal, Russian Volume Eyelash Extensions using the latest Lash Perfect technologies. More treatments available please contact me Julie at Chichester Beauty. Our friends are: The Beauty Rooms Chichester and Champneys Chichester https://www.champneys.com/city-spa/chichester/ Let us know your favourite beauty salons in CACI Chichester specialising in Russian Lashes, electrolysis, hair removal, and caci Chichester facials. Caci Chichester, Caci Chichester, Caci Chichester, Caci Chichester, Caci Chichester.